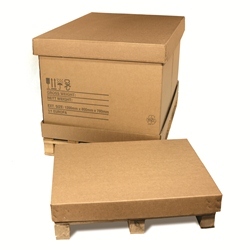 Cardboard pallet boxes come with Cap, Tray and Sleeve components and are supplied with heat treated pallets as standard. Our pallet boxes are made from strong, heavy duty stitched double wall corrugated cardboard, which can be cut down to the required height. Perfect for shipping and transportation of heavy items, or the bulk packing of goods. Available in a range of sizes. Browse the selection below and order online.